Medi-Materials | Protective LVAD shirts, Undervests and Accessories. 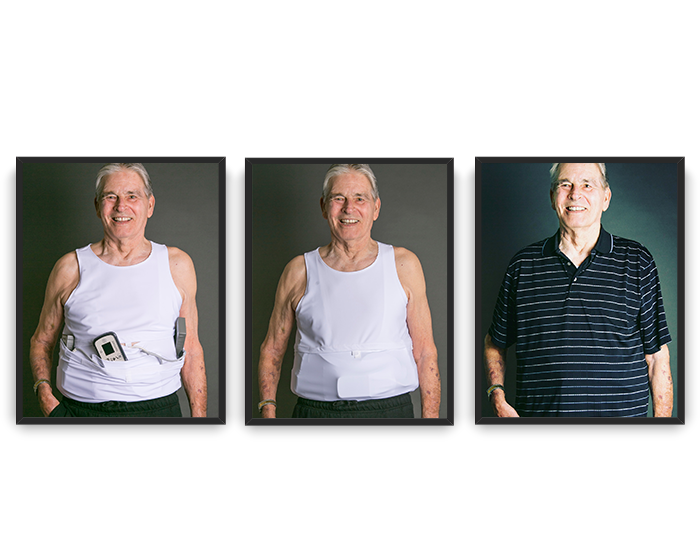 "IT ALL STARTS WITH THE HEART"
The Freedom Undervest is an undergarment designed to safely and comfortably carry the external LVAD equipment for LVAD recipients. Fully conceals and protects the driveline from snagging and damage that may lead to driveline fractures. The Freedom Undervest is an LVAD shirt or vest designed to safely and comfortably carry external LVAD equipment for LVAD recipients. It conceals and protects the driveline from snagging and damage that may lead to driveline fractures and infections. The Protex DL Driveline Protector is made of Cut-Tex Pro, a slash-resistant smart material which is then encased within a weatherproof outer shell. Protect and encapsulate the driveline using overlapping soft Velcro fasteners for easy coverage. Medi-Materials is comprised of a team of highly trained Perfusionists, designers, engineers, and manufacturers, dedicated to delivering impeccably-made products such as our Freedom Undervest, the first TRULY Protective LVAD shirt and our Protex DL driveline protector.. The use of silicon tape on compromised drivelines offers very little protection from further damage. The Protex DL provides substantially more protection for both damaged and well maintained drivelines. I have many very active LVAD patients. The Protex DL will allow them to continue living full lives with less risk of driveline damage. Almost daily we see LVAD patients needing Rescue tape applied and re-applied to their damaged drivelines. The driveline protector gives me peace of mind and a sense of security when I'm sleeping. HeartMate II recipient since January 2012. I feel more secure with the driveline protector. I’m not worried anymore about what could happen if my driveline catches on anything or if I accidentally sit on it. HeartMate II recipient since March 2015. I’ve been very sensitive about these lines. Having this has made me relaxed. HeartMate II recipient since November 2013. © Copyright - Medi-Materials | All Rights Reserved. View Cart The Product has been added to your cart.